Looking for a really unique gift for twins? 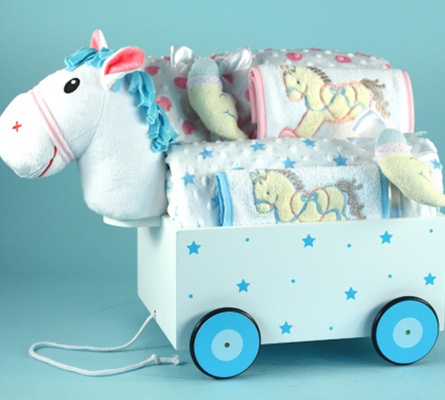 Check out this adorable Pony Wagon filled with quality layette items for each baby. Fabulous Pull-Wagon Toy At the heart of this gift is a beautiful and distinctive wagon pull-toy. 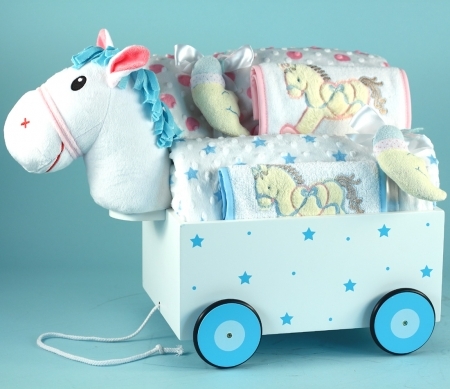 The wagon is made of wood, painted white with decorative stars, then topped off with a soft & plush pony head & fabric tail. 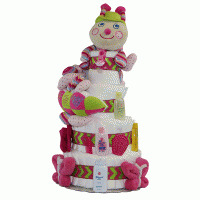 It is a well made toy that the two babies will share and enjoy for years as they grow. The wagon meets all USA product safety requirements. Children under 3 years of age should have adult supervision when playing with it. the wagon measures 22" x 10" x 16" (high). 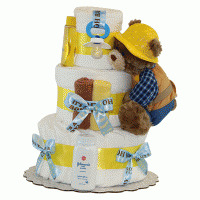 Layette Items for Twins Whether it's for twin boys, twin girls, or one of each, we will customize your gift with the appropriate color contents. Don't forget to choose the appropriate gender combination above. 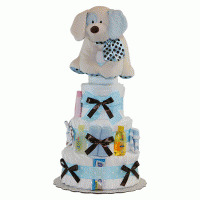 The gift includes: Two soft & plush baby blankets Two bibs with rocking-horse embroidery design Two soft moon toy rattles This gift for twins will be beautifully arranged as shown in photo, then wrapped in tulle to make a stunning gift impression.